The CNN headline says the move is a "purely political gesture." Here's the full CNN headline: "In a purely political gesture, House Republicans vote to repeal President Obama's signature health care reform law. " That's not even the most biased headline on ObamaTax you'll read today. At Politico, five governors have declared they won't expand Medicaid per ObamaTax's requirement (a requirement struck down by the Supreme Court). 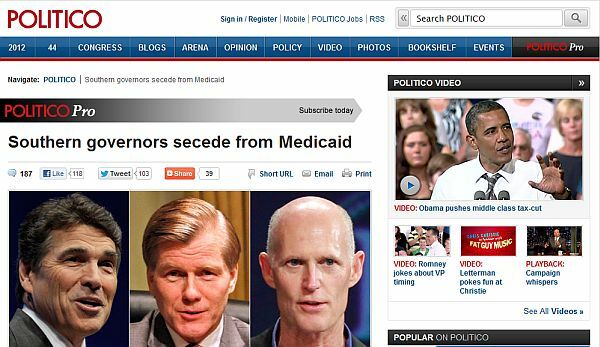 How does Politico report the news that five southern governors indicated their decision? Secede, I get it. Like the Civil War. Because they hate blacks. Because, you know, opposition to ObamaTax is racially "intolerant." Thanks to @rdbrewer4 for the "secede" catch, and @slublog for screencapping it.